This composition focuses on artistic and intellectual development in Utah. The adult muse offers educational guidance to the child, who represents the youth of Utah. 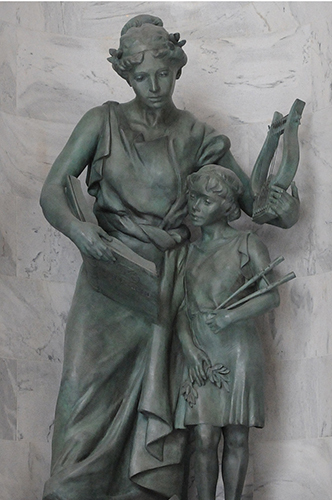 The muse cradles a lyre, an ancient symbol of music and poetry. The young girl peers into a book of names of great authors of the Western world. The book, titled Literature, features a picture of a gryphon. A scroll of sheet music extends over the front of the base and offers the girl her next learning opportunity. The girl holds an aulos, an ancient Greek flute. The unfinished wreath in her right hand symbolizes yet unrealized potential. The two large volumes lying at the girl’s feet represent the unlimited knowledge and stimulation available to those who read for sustenance. The lower book, titled Civilization, metaphorically contains all human knowledge. The top book is open to a list of fundamental categories of inquiry. This composition, based on the symbiotic relationship of science and technology, reminds us of the importance of past, present, and future scientific and technological growth in Utah. 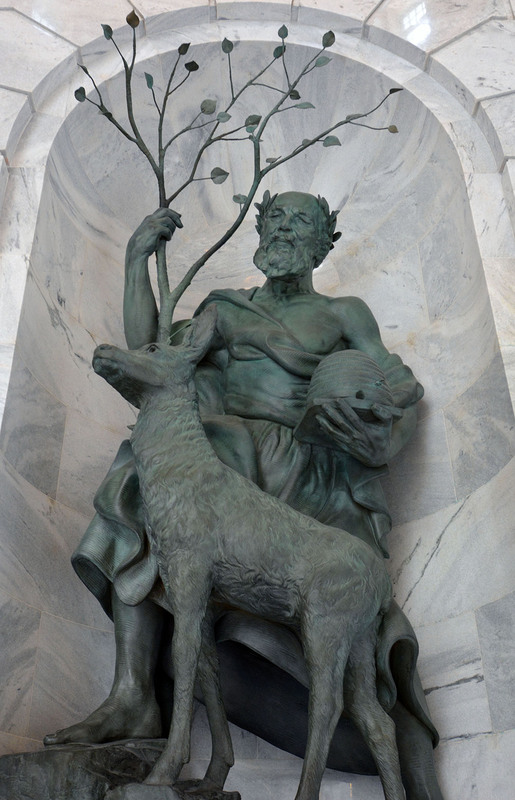 Science is the adult mentor in this sculpture, as science ultimately provides for the development of technology with its most basic knowledge. Science inspires the curious youth, Technology, with the spirit of discovery. 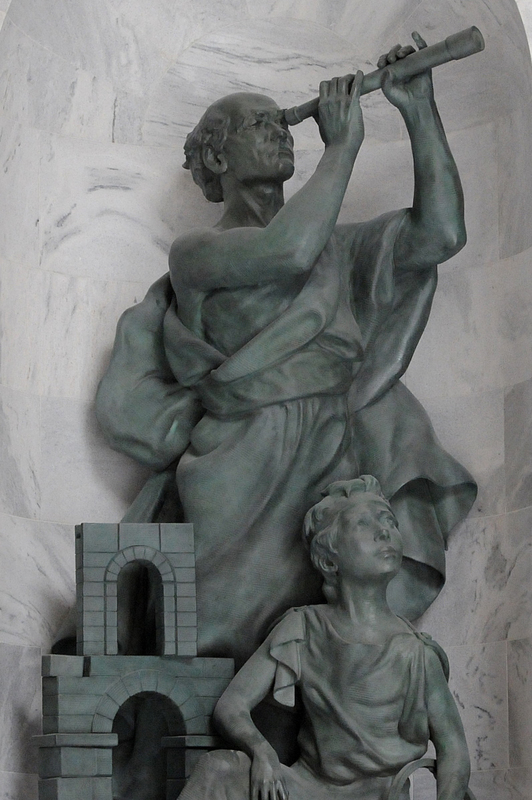 The symbols of innovation used in the sculpture were selected for their universal and timeless recognition. Science’s telescope is similar to the kind Galileo would have used. The young Technology is seen with a wheel, derived from ancient Greek chariot designs; an aqueduct of the type commonly found in ancient Rome; and a compass, his design instrument. This sculpture symbolizes the value of welcoming new Utah citizens from all backgrounds. Blowing from the past, a breeze moves the adult spirit’s robes toward the future of Utah. 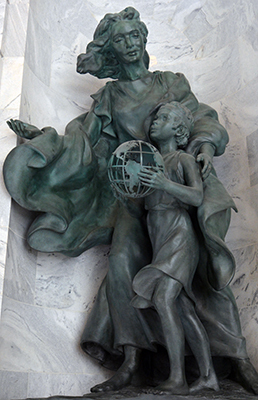 She leads the next generation, represented by a small girl holding the Earth. The spirit barely touches the girl’s shoulder, providing loving encouragement but leaving the girl to decide for herself whether she will settle in Utah. The hollow globe suggests that the weight of the Earth’s troubles should not deter future generations from finding a place to freely develop and express their ideas. Utah and the Great Salt Lake appear on the globe in the direction toward which the girl is walking, and she marches into the future filled with excitement, trust, and expectation. This composition is unique among the niche sculptures, as the youth is represented by a Rocky Mountain elk calf. The healthy calf pauses on a mountainside, watched over by the spirit of an older man, the symbol of wisdom in the community. The man carries a beehive, the state’s unique symbol for industrious living. The interaction of the two figures beside an aspen tree on a mountainside reminds us of the heavy responsibility that Utah’s community carries as steward of the land. The composition suggests that a community filled with the strength of industry and wisdom will be up to the task.